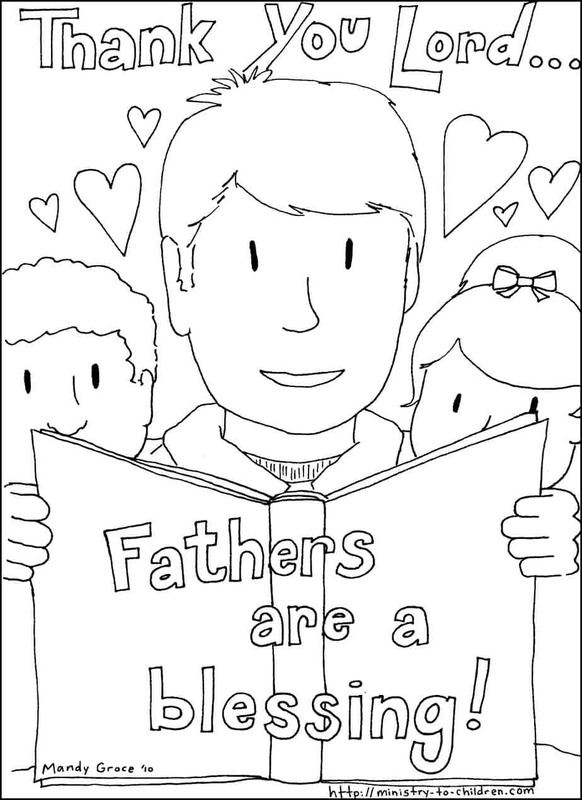 We’ve combined our free coloring pages for Father’s day into one easy to print file. Simply click on the image above to open file. Included in the combined file are the sheets from this pages and the two others designed for churches who want more ethnic diversity in the illustrations. 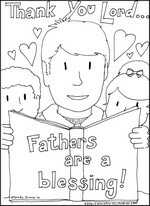 If you want even more, we have a set of printable “I love Daddy” cards that children can color as a craft for Father’s Day. 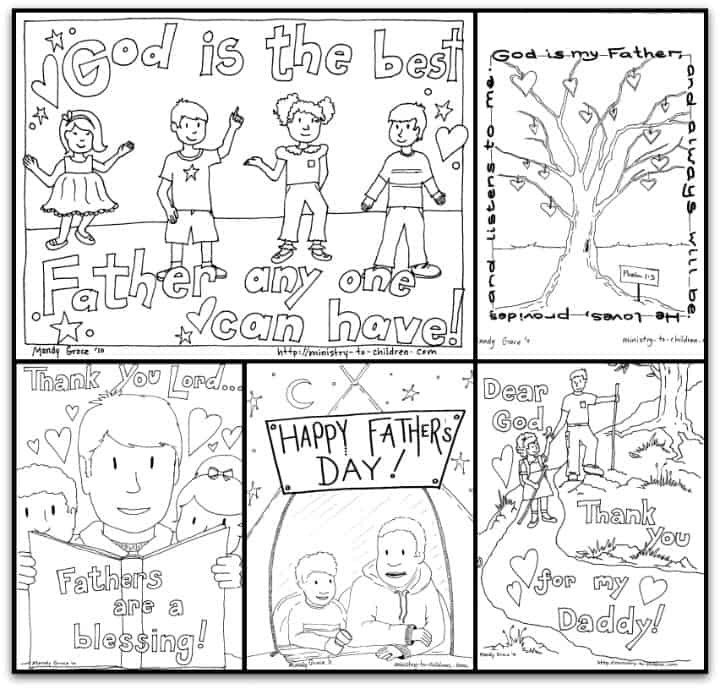 Here are three original coloring sheets you can print out and use at church or home around Father’s Day. These were created by Mandy Groce, a visual artist who reside in Kentucky. Based on previous feedback she wanted to give several choices to better fit the diverse families that make up many churches. Directions: Each of these preview images link to the printer friendly PDF version of that picture. We also have uploaded the full size jpeg images for anyone who wants to modify these pages directly. The first coloring page shows a father reading a Bible while two children (boy & girl) watch over his shoulder. The text is a prayer that reads, “Thank you Lord, Fathers are a blessing!” You can download this file as a printable PDF file or as a JPEG image (453K file size). The second coloring sheet has a father hiking with his daughter following along. The text in this picture is a prayer which says, “Dear God, Thanks you for my Daddy!” You can download this file as a printable PDF file or as a JPEG image (534K file size). The third coloring page pictures only four different children (2 boys & 2 girls). 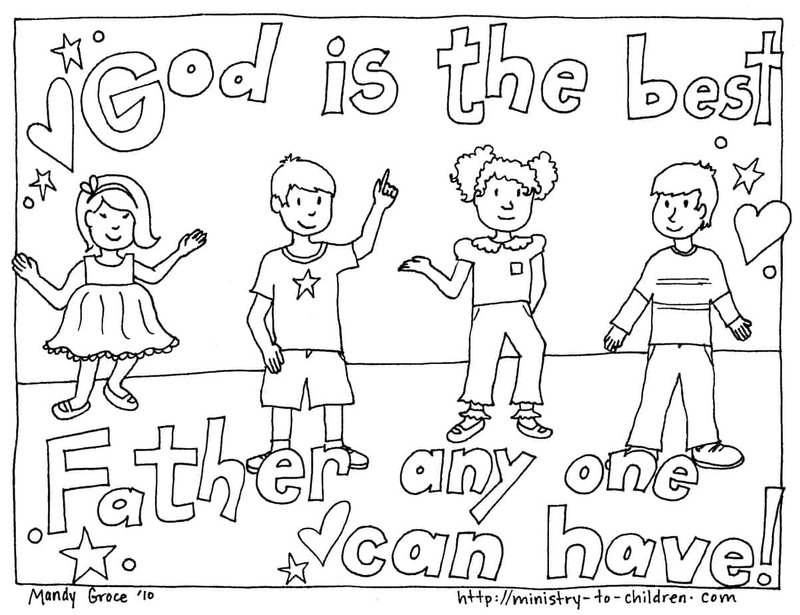 There is not father displayed in this frame but the text says, “God is the best Father anyone can have!” This one will provide an option for children who have no dad in their life and may feel left out at father’s day. You can download this file as a printable PDF file or as a JPEG image (814K file size). 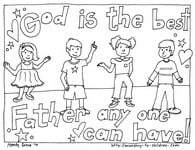 Father’s Day can be a good time to remind children that parents are a blessing from God. Care should be taken not to exclude kids who have lost their dads. Here is a recent article on our website that deals with those painful father’s day issues. Don’t miss all our ideas for father’s day at church. You might also enjoy our Father’s Day crafts and Father’s Day Sunday School lesson. For even more printables, don’t miss the coloring pages from What’s in the Bible. I love the way this lesson represents all family arrangements and does not make any child feel left out. I teach in an urban situation where many of the children do not have that nuclear family. Thanks for giving me a way to handle this day with God’s love. I would also suggest that other family members who do play the ‘Father figure” could somehow be incorporated. Tony Kummer (Editor) reviewed & updated this page on : June 19, 2017 at 8:20 am. All our content is peer reviewed by our readers, simply leave a comment on any post suggest an update.